Another joyful day, when I went back home and find my Vanity Trove box. Yup, my July 2013 edition has arrived. With the theme “Seaside Beauty”, I’ve found 7 (yes, seven) full sizes inside my box. Wow, how generous! Ranging from body care, skin care, makeup and beauty voucher, this edition box smells terrific when I opened it. It turned out to be the Cow Brand Shizen Gokochi Green Tea Facial Soap’s scent (no wonder it smells like green tea!). Said to be one of the best facial cleansers in Japan, I can’t wait to try the soap bar. Please don’t tell me you haven’t subscribe to Vanity Trove Indonesia. You’ve missed some and you’ll miss many later. Just click here to subscribe and get special prices for my readers. It’s as easy as one two three, really. Last Thursday, I was invited to the launch of ANTEPRIMA Mini Lucchetto at their store in Plaza Indonesia, Jakarta. It was a launch/shopping/fun event. In collaboration with Marie Claire’s Indonesia magazine, I was surprised to found out that this new IT bag from Anteprima is quite affordable. For 2.7 mio rupiahs, the Mini Lucchetto which comes in various colors definitely will add a splash to our wardrobe. Still, I prefer the black one with the ever cute skull brooch (see my pics above). The strap is adjustable and removable, so we can carry it as a clutch or sling bag. The most fun part, we can add brooches and attached them to that iconic wire bag material. FYI, you have to order exclusively for that brooches (as they’re not ready stock items in Anteprima Jakarta’s store). Check out the pics from the event above. Seems like everything about skin care innovations, the hair will follow. Take BB Cream for example. When BB Cream for face launched as the latest beauty trend, they created BB Cream for hair. Then they went to CC Cream, and so did hair. Well you got what I meant. So it comes to no surprise when Kérastase created the first serum for hair. Inspired by the incontestable success of skincare serums (one of them is LANCÔME Génifique) which changed the whole skincare routine, especially for women, Kérastase created the first concentrate which generates at its source the growth of a stronger, shiner and more beautiful hair, named INITIALISTE. You’ve probably heard about the precious stem cells? With their high regenerating power, these cells won’t be affected by aging. But, as fragile as they are, their functionality will reduced due to internal and external aggressions, like oxidative stress, pollution and UV. Guess what? Stem cells existed at the hair follicle’s level, too. Discovered by the Recherche Avancée L’Oréal after 24 years of research, the 2 stem cells pools are as precious and as fragile as skin’s. Therefore, they have to be protected and preserved, to achieve the growth of more beautiful and stronger hair at its source. Personally, I can’t wait to try the hair serum (and dig more about it for you), which IMHO does look like LANCÔME Génifique bottle, right down to the dropper (don’t you think so too?). I’ve read from other bloggers’ reviews that it successfully made their hair feels softer and thicker, easier to style, shinier with less breakage & split ends. Now I wonder if it’s going to be love from the first use for me? Stay tune, as Kérastase and Lancôme will have bloggers’ exclusive event soon (named Super Serum Duo Pampering Day) and of course, I’ll be there. Don’t call yourself one of the Japanese foods’ fans if you never tried Katsu at Katsusei. Located at two of prestigious malls in Jakarta, Indonesia, Plaza Indonesia and Grand Indonesia, Katsusei just opened their third outlets in Gedung Sentral Senayan 1. And to introduced their latest menus and Special Lunch Set, fellow medias and bloggers were invited to their outlet in Plaza Indonesia, to have lunch with the owner, Sylvia Gunawan (she’s also the founder of MIKA Japanese Bistro which I’ve previously featured here). Known for their delicious and crunchiest cutlets, Katsusei is a franchise Japanese restaurant from Utsunomiya, Japan and the first and only katsu-specialized Japanese restaurant in Indonesia. “We made our own fresh panko (that’s bread crumbs, btw) at least twice a week to keep the crunchiness of our katsu. Even the vegetables were cut one hour before lunch time to keep them fresh when served. And try our rice, it’s the best quality of Japanese rice,” said Sylvia during the press event last Wednesday. First, we were served with the side dish, Atuyagi Tamago. Steamed egg rolls come in layers, served cold with shoyu and horse radish. The unique flavors of sweetness from the eggs and saltiness of shoyu made this side dish a good starter before the main course. Then came the hot soup, Miso. No fishy taste and smell, nice soft seaweeds and fluffy tofu made this soup a warm welcome for the long awaited crispy cutlets. What I love about Japanese culinary is their tradition. And Katsusei offers the authentic recipes right down to the DIY making of their secret recipe sauce, Tonkatsu. Small bowl and crushed stick from wood was provided to grind our own Tonkatsu sauce. First, get some sesame seeds, grind with circling motion then add the sauce just the way you like it. I enjoy doing it and hearing the crunchy sound of sesame seeds being grind. And the crunchiness didn’t stop there, as the main course arrived. Mixed Chicken and Shrimp Fry served with lemon slices arrived at our table, looking delicious and so golden, just like those food plastics I’ve seen when I entered the restaurant. Served with the DIY Tonkatsu Sauce, I can feel the crunch (thanks to the fresh Panko) as I bite and the softness of the chicken and shrimp inside. It was like a blast of flavors, a combination of sour, sweet and savory in a bite. And even though I’m not a big fan of white rice, I really love Katsusei’s rice. It wasn’t as sticky as other Japanese restaurants I’ve tried, just a great taste of white rice. I believe because the Japanese people are so picky when it comes to their rice. “All the authenticity of Katsusei’s menu are supervised by our Japanese Head Chef, Mr. Takeshi Kato, so the quality was unquestionable,” add Sylvia. Another Japanese tradition, after the rich meals, we were served with a complimentary glass of hot Hojicha Tea. They said, it was good to dissolve all the fats from fried food. Even though all the cutlets were fried with Canola Oil (100% fat free), we still want more fat free, right? After sipping the rather bitter but very nice tea, desserts are coming. I picked the Coffee panna cotta, simply because I love coffee after meals. It was a really delightful food adventure day for me. This is how the Kardashian’s sisters saw Spring Summer through their fashion collaboration with Dorothy Perkins. Yes, the second batch from Kardashian Kollection by Dorothy Perkins is coming to Jakarta tomorrow. So, Kardashian’s sisters fans out there, be prepared to go to Dorothy Perkins’ stores in Grand Indonesia and Central Park (FYI, there are only two stores in Jakarta which carry this Kollection). I was invited to their VIP Preview today at Grand Indonesia, and have a chat with an insider about how successful the first Kollection was. Apparently, Indonesia sold the most Kardashian Kollection Autumn/Winter 2012 compared to our neighbors in South East Asia. Wow, Kongratulations! So, what to expect from the Spring Summer 2013 Kollection? Definitely more fresh color, even though there are still black here and there. Graphic prints, body con dresses, light jacket in ombre colors, and a series of cute clutches and sling bags. I can still see the sisters’ individual style in the whole Kollection, like the glamourous body con dresses are so Kim, the loose tops are so Kourtney and the black leather lined leggings are so Khloe. Yes, there is something for everyone. Can’t get enough of Givenchy? If you’re a die-hard Givenchy connoisseur, you’ll be thrilled to hear that Riccardo Tisci has decided to relive the watches collection. As you might know and realized by now, the previous Givenchy watches collection was discontinued in 2009. Each named after a prime number and featuring such luxuries as gold plate, interchangeable straps, and a distinctively rugged feel, the collection is exclusively available at Colette, Barneys New York (in NYC and Beverly Hills), 10 Corso Como in Milan, Seoul’s Boon the Shop, Selfridges, and selected Givenchy stores. The watches will hit a wider range of boutiques in September. This is my video tutorial with wolipop.com. It’s in Bahasa Indonesia (sorry for my foreign readers). But I believe you might get the idea just by seeing this short yet informative video. Thanks for watching. I AM NOT INTO SPORT, BUT I’M INTO THIS SPORT…. Unlike any resort collection that somehow seem to “resorty” for me, fashion Director Grazia Malagoli took my attention to write about Sportmax Resort 2014 collection. Inspired by photographs of businessmen in the Nineties (hello Wall Street), Grazia Malagoli put a feminine touch and styling on a more serious tailoring. It’s truly a believable masculinity meets femininity at its’ best. Fashion show presented by Karen Millen & Marie Claire stylists. Combination of inspiring story and launch of two empowering products. End of May 2013, I was invited to an event “The Power of Beauty” by Kiehl’s Indonesia, collaborated with Marie Claire Indonesia Magazine. The event took place at their boutique in Sogo Plaza Senayan, Jakarta, and it wasn’t just an ordinary product launch event. It was a celebration of beauty, not just skin deep but more to the beauty of being alive and healthy. I personally believe that natural ingredients for skin products are expected by many customers around the world who lately become more concern about healthy lifestyle. And Kiehl’s has been doing that for more than 150 years ago when they began as a New York City pharmacy. They keep updating on natural derived ingredients to make our skin healthier and beautiful, naturally. Like their latest invention for the Powerful duos, Powerful Wrinkle & Pore Reducing Cream (Rp 550.000) and Powerful Wrinkle Reducing Eye Cream (Rp 395.000). Calcium PCA and Copper PCA are the main powerful ingredients in these products, which are also Paraben Free, Fragrance Free and Mineral Oil Free. Known as a skin conditioning humectant to improve skin barrier, calcium also shield our skin from wrinkle-inducing aggressors. Meanwhile, copper acts as a powerful collagen and elastin building mineral that fortifies skin structure for a smoother and more youthful appearance. Combined together, these composition will help to bring our skin’s elasticity back to its’ track, resulting less visible pores, smoothed texture and reduced wrinkles. I wish this cream was invented when I was 20. Anyway, here’s my first verdict of the cream: The luxurious cream is as rich as it gets, really hydrating and a pea size is enough for the whole face. Soft yet creamy, it absorbs easily into the skin and doesn’t leave any sticky feeling upon applied. Bonus point, there’s no synthetic fragrance added. As they claimed that within 4 weeks, we’d be able to see visible results on wrinkles and skin texture improvements, I can’t wait for mine to deliver. 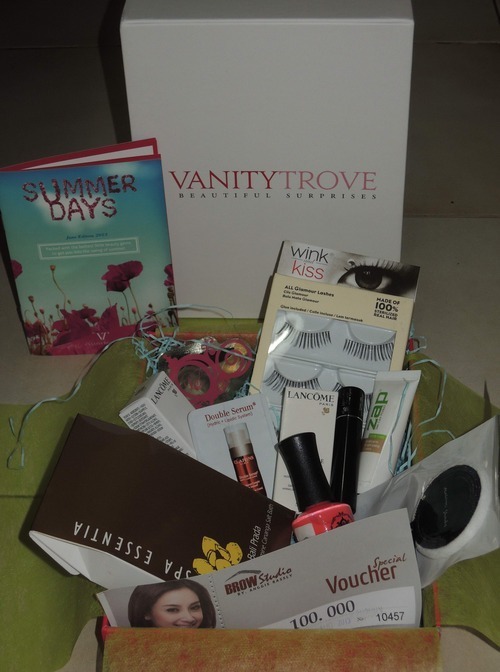 My “Summer Days” are officially starting, thanks to Vanity Trove Indonesia. If you don’t know already about Vanity Trove, you must’ve missed my previous post here. And… never a better day to open my trove at the beginning of June, known as the holiday season (thanks to school holidays). As I’m preparing my family holiday, my monthly beautiful surprises, surprised me once more. Their June 2013 edition theme is “Summer Days” and filled with beauty goodies to company me throughout my holiday with my lovely boys. Instead of all samples sizes, lucky me, I’ve got three real sizes this month. They are: Lioele Nail Color (and the color name is “Bikini Pink”), Wink Kiss Premium False Lashes and Masami Shouko Powder Puff. And…I’ve got myself a voucher worth Rp100K to try Natural Dreamlash at Brow Studio by Anggie Rassly (I definitely going to use this voucher soon, and I’ll review about the result later-so stay tune). The rest of the items inside the pretty box are: Spa Essentia Salt Bath, Lancome Visionnaire & Hypnose Doll Eyes Mascara, Clarins Double Serum, Lioele BB Cream and Zap Underarm Brightening Cream. Envy me? Don’t. Just be a part of the Vanity Trove Indonesia’s troops because it is that simple to subscribe: just click here to get your special price. You just sit there and relax, wait for them to come knocking at your door every month to be enjoyed. Because that’s what beauty is all about, to be enjoyed.